Free-to-play social game heading to U.S. and Canada. Players can register to receive a card featuring Cloud from Final Fantasy 7. 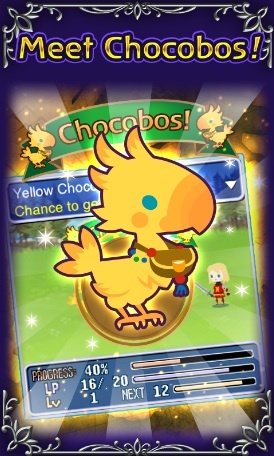 There's more Final Fantasy on the way to iOS and Android, courtesy of Square Enix and DeNA. Final Fantasy Airborne Brigade, already a huge hit in Japan with three million registered users, is on its way to the U.S. and Canada, earning the distinction of being the first free-to-play Final Fantasy social game to see an English translation. In it, players hop aboard personal airships and explore the Final Fantasy universe, eventually teaming with other users to form airborne brigades to tackle enemies, including bosses. Over time, they'll gain experience and pick up items from the RPG series. "We're very proud to offer Final Fantasy fans based in the US and Canada our own take on the themes and ideals of the series with the upcoming launch of the mobile game Final Fantasy Airborne Brigade," said Kenji Kobayashi, executive games director at DeNA. "In celebration of the franchise's 25th anniversary this year, we strived to create a unique gameplay experience where players can elevate each other through fun, cooperative play." No release date yet, but for now, prospective players can pre-register to receive a three-month exclusive card featuring Cloud from FFVII, which should prove useful during boss fights.